Recently heard about 'Maa Baglamukhi Yantra' so was curious to know more about this yantra. What exactly is the purpose of this yantra? 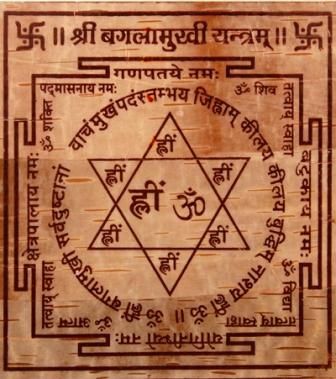 Who was the first person who used or we can say was originator of this yantra? Any other interesting facts (worth sharing) associated with this yantra? First, we need to know what the purpose of a Yantra in general is. In Hinduism, although the God is essentially stated to be Nirguna, but Saguna worship is mainly recommended, as worshipping the form-less is basically an impossible task. And, for that purpose, symbols (Pratik) are introduced in various scriptures, in which we invoke the presence first and then worship the deities. In Vedas, fire is the mode, in Upanishads Om is the Pratik, in Puranas it is idols (PratimA) and in the Tantras it is (primarily) Yantras. O Devi, know the Yantra to be Mantra-mayam (mantra-endowed) and the Deity to be of the form of mantra. If worshipped in Yantra, the deity is appeased instantly. Besides that, Tantras also say that unless worshipped in a Yantra, the deity is not appeased. O Beloved, just like the Jivas have the bodies, the lamps the oil and ghee, likewise, for all deities are laid down their respective Yantras. So, a Yantra is basically a dynamic graph which can be identified as the respective deity's body. Also, as it is Mantra-mayam, it is also endowed with the divine consciousness of the deity. So, in other words, there is no difference at all between a deity and it's Yantra. Whatever worship that is offered to a Yantra goes to its respective deity. Now, it should be easy to understand what Goddess Bagalamukhi Yantra represents. It is Lord Shiva of course, because he has created all the Yantras that we have. Including the various Yantras of his consort. First draw a triangle pointing up; over it draw a Sharasram - a six-pointed star which is formed by drawing two triangles one pointing up and one pointing down; over it draw a Vritta - a circle and on it draw an eight-petalled lotus. Finally draw the Bhupura (the squarish enclosure) over the configuration. The basic purpose of Bagalamukhi worship is to achieve Stambhana, one of the Shat Karmas of Tantras, which basically means to completely paralyze a wicked enemy. For the benefit of the devotees and for paralyzing the evil groups of enemy (vairi) I am revealing the Bagalamukhi mantra, which is as powerful as the Brahmastra. This mantra can paralyze anyone or anything. Even the movement of air can be stopped by its mere remembrance, what to say of others. So, the purpose is Stambhanam or completely paralyzing (or subjugating) one's evil enemy. Not the answer you're looking for? Browse other questions tagged rituals tradition yantra bagalamukhi . What is the purpose of Sankalpam?